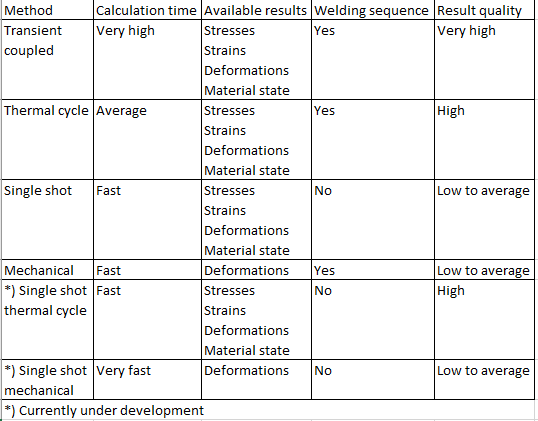 Simufact Welding comes with a scalable simulation approach: For certain result quality the model complexity and the calculation time can be scaled between several weeks and few hours. Simplification approaches always reduce the quality and the amount of results, but they are often sufficient for certain investigations. 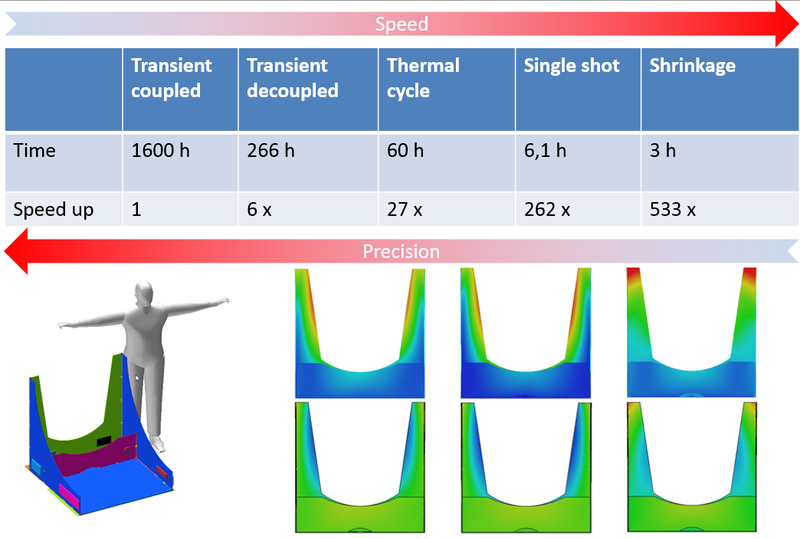 For thermal joining Simufact Welding offers five modeling approaches, beginning with precise, but slow transient thermomechanical fully coupled simulation going down to fast shrinkage approach. Simufact Welding provides the flexibility to select the proper approach for a given simulation goal. A fully coupled transient thermo-mechanical simulation works in the way that in each time increment a temperature field is calculated. This thermal calculation is – compared to mechanical one – relatively cheap in terms of calculation time and scales nicely with the number of used CPU cores. If material with phase transformation is used, the phase proportions are also calculated during the thermal step, making it a thermos-metallurgical step. After each thermal step follows the mechanical one, where thermal strains are calculated out of the already given temperature field and acting as mechanical loads for distortion and stress calculation. This mechanical step is relatively expensive in terms of calculation time. If the model is nicely converging and thermal calculation is delivering good realistic results, it is usually possible to replace the above described full coupling with a weak coupling, meaning, that not every thermal increment is followed by a mechanical one, but only every n-th increment, n being some number greater than 1. In converging models with sufficiently small time increments the loss of accuracy is usually relatively small while the calculation time decreases rapidly. The level of decoupling can be defined in Simufact Welding for each load case type (welding, cooling, heating and so on) separately for each process. In addition to the definition of decoupling it is also possible to reduce the output data to coupled increments only to save the needed hard disk space. This approach does not change the model itself, only the level of coupling. Further possibility to significantly reduce the needed calculation time is the usage of so called thermal cycle instead of a transient heat source. A transient simulation, where the heat source is represented by a moving heat flux, needs a lot of time steps in order to represent the movement of the heat source. It is however possible to replace the heat flux by a prescribed time-temperature-curve acting on the complete weld line at once. This approach shows good distortion results for problems where distortions are caused by shrinkage, but neglects most of upsetting effects, however reducing the calculation time significantly. Further simplified approaches are also neglecting the welding sequence. Single-shot solution automatically replaces all heat sources in the model with thermal cycle and also recalculates welding duration of each weld line as well as deactivation times of fixtures, applying all heat sources at once. Depending on the particular model the result quality can be sufficiently high, or rather low. 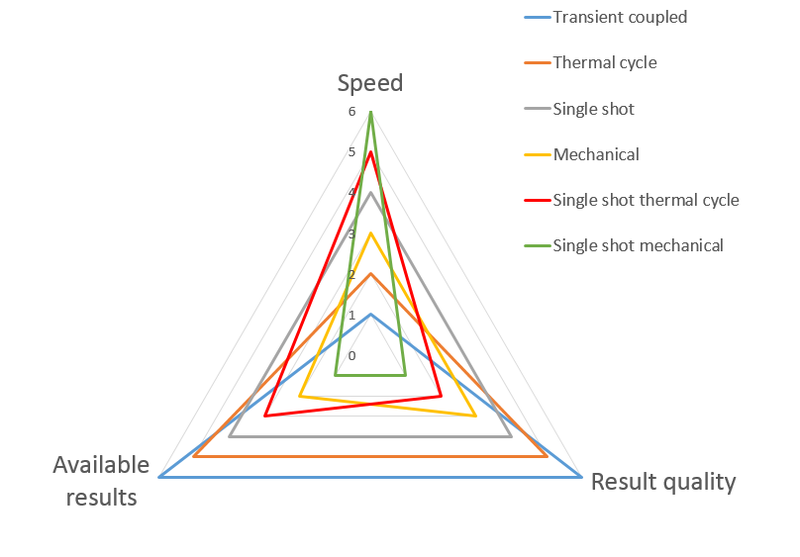 For an already created model the remodeling effort is rather low: the user has to turn the single-shot solution on in the process settings and also select a thermal cycle table to be used for heating. A further step is the Shrinkage approach, only usable for processes, where all weld lines are also having filler material. In this approach the non-linear material behavior and heat transfer between filler elements and base material is neglected. Filler elements experience a thermal load leading to their shrinkage, the shrinkage leads to deformation of the assembly. The result quality is highly dependent on the particular model, there are models that are well-suited for such approaches and there are models that will produce somewhat imprecise results. The activation of this approach works just by selecting the shrinkage approach in the process settings. Everything else is calculated automatically by the Simufact Welding GUI. Also rather huge models can be calculated within a rather short period of time. 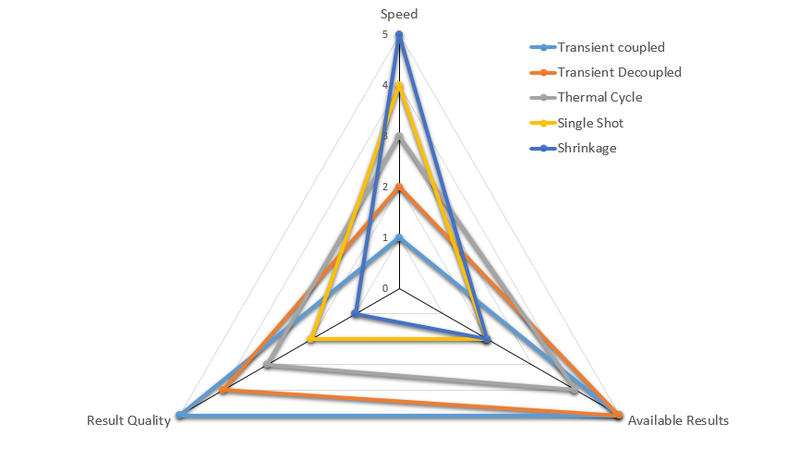 In the lower half of the above figure the total distortions and distortions in Y-direction for thermal cycle, single-shot and shrinkage approach are shown on the same scale. Y-distortion shows similar tendency for all approaches, while the total distortion varies largely for shrinkage. The lies in the fact that for this particular model the Y-distortion is basically governed by shrinkage while other directions also experience an influence from upsetting, which is completely ignored in the shrinkage approach. Decoupling can be basically used in all situation, depending on how stable the model is calculating. Be careful if phase transformations are involved: too coarse decoupling can lead to the situation where the properties of material undergoing phase transformations are not sufficiently respected in the mechanical step. Thermal cycle is also usable in most cases, however the calculation time (the number of needed time increments) decreases more if the weld line where thermal cycle is applied is sufficiently long. Single-shot approach is recommended in models with a high number of long weld lines. It basically uses the thermal cycle method and neglects the welding sequence. It shows nice results if the weld lines of a model do not interact with each other, meaning, do not have significant contact areas. Shrinkage approach field of application is similar to the single-shot approach, neglecting also effects of plastic upsetting. Sinlge-shot and Shrinkage approaches can give a fast estimation of distortion directions due to welding. Furthermore, they can be used to check if the model setup is OK. For instance, if a fillet of some weld line welded at the end of the process has bad mesh quality or is causing contact trouble, in a usual simulation that respects the welding sequence its effects on the convergence (that might lead to instable simulation) are only visible during this particular weld line is welded, possibly after days or even weeks of calculation time. Neglecting welding sequence allows the estimation of the quality of the model within at most hours. Those approaches are also helping during assembly design. While they are not delivering exact results, different designs of the welding assembly and of clamping tools as well as positions of weld lines are usually influencing the final distortion. This way it is possible to calculate several variants of the assembly within a rather short time period, allowing to compare the influence of changed assembly on final results and to select a design best suitable for a given assembly. 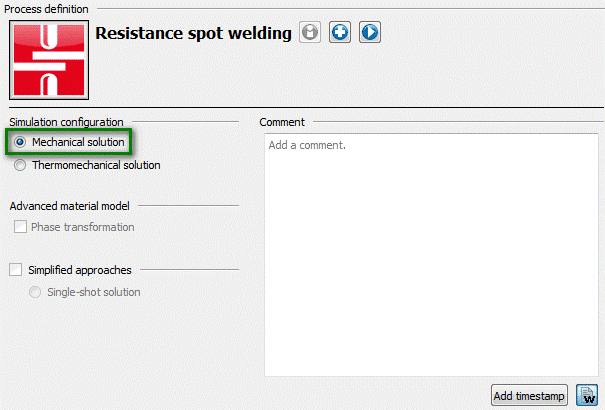 For resistance spot welding Simufact Welding offers 4 different approaches to speed up the calculation. 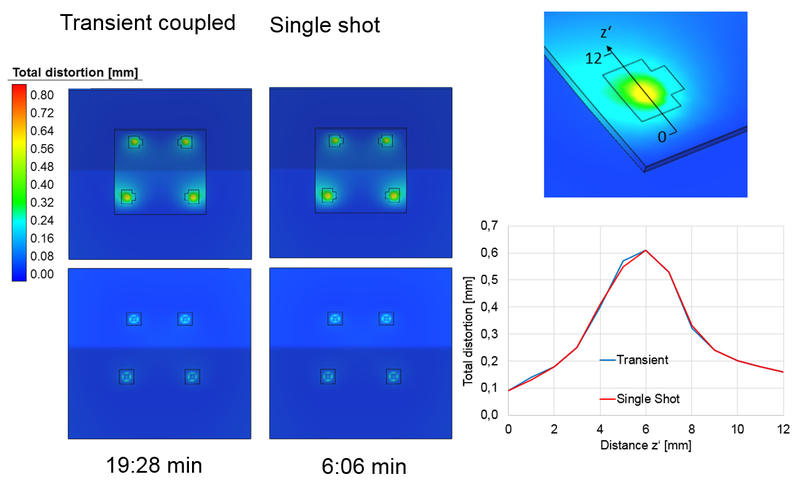 Beginning with most precise transient fully coupled approach to single-shot and purely mechanical approaches they offer the possibility to vary result quality and calculation times according to the simulation goals. The table below allows the selection of appropriate simplification according to the goals to be achieved in the simulation. Similar to transient approaches in thermal joining, transient coupled simulations in resistance spot welding are representing the complete coupled physics behind the welding process, including heat generation due to Joule’s heating as well as metallurgical and mechanical simulation with respect to welding sequence. The Mechanical approach, activated in the process settings (as shown in above figure), requires an already defined model. It neglects all coupling effects, only applying a force to electrodes and gluing the component surface areas touching each other between the electrodes. The welding sequence is respected. 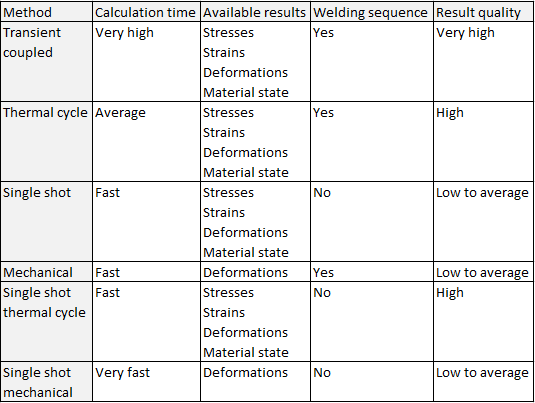 The approach shows nice results if it comes to overall distortion of the assembly, detailed results in weld spots differ because the material does not experience any temperature, so especially if it comes to evaluation of material properties and stresses inside the spots, this approach is not recommended. The Thermal cycle approach is very similar to thermal cycle in thermal joining. The idea is, if a temperature curve inside a single spot of a welding process is known (due to measurements or process simulation), other spots applied with same parameters should be very similar. 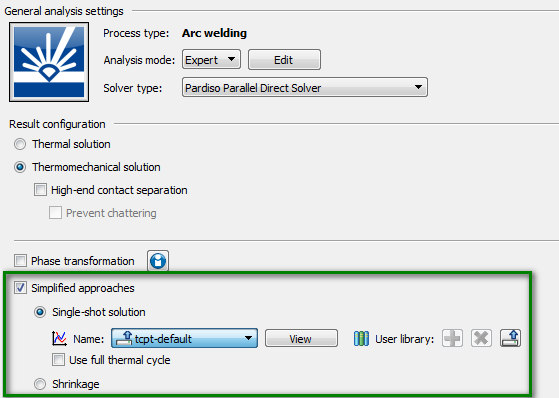 The thermal cycle approach requires a usual resistance spot welding model setup. 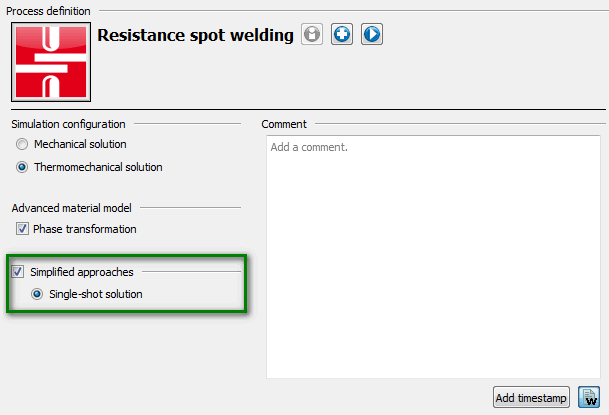 The only difference is the definition of Resistance spot weld parameters. To activate the approach, the specification mode is switched to “Thermal cycle”. Then it is possible to define a time-temperature table. The length of the table is scaled according to the length of defined force table. Afterwards the cross-section of the nugget can be defined as elliptical or cylindrical geometry.